Huh huh huh. We're getting wood. - OK Mr. Sunshine! Huh huh huh. We're getting wood. So I had a contractor look at our existing floors. Basically, we're good to go with the hardwood and tile. We may have to have the toilet plumbing tweaked to accommodate for the extra bit of height off the floor, but that's about it. The existing carpet and pad are about as thick as the hardwood, so I doubt we'll have to have any doors rehung. Front door crash pad - Daltile Gold Rush in Golden Nugget. Its main color is a paler version of the hardwood base color, and its subtle pattern doesn't compete with the prominent grain of hickory. I haven't officially chosen a tile pattern, but hopscotch is my current favorite. Bathroom - 6" clipped corner white squares with gloss black accent dots. This is an octagon and dot pattern that will coordinate with the existing seafoam green wall tile for a funky yet classic look. We could get deep teal accent dots that look like a darker version of the wall tile, but I'm afraid that this would look too matched. Corny. You know what I'm getting at. Everywhere else except the kitchen, which isn't getting redone - Bruce American Treasures 3/4" solid hickory strip in the skinnier width offered (what you typically imagine when you think of a hardwood floor). 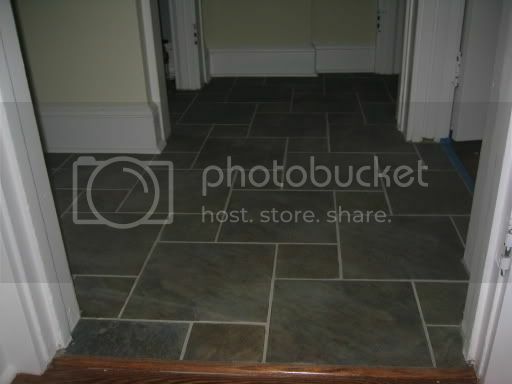 Here are some pictures of hickory floors. Ours will look like the lighter colored ones on that page. You are not going to embrace a do it yourself attitude to remodeling?!? Your place is going to be look so different!!!! The next Chester gets spooked with a bag of eggs it will be a lot easier to clean up. We decided to hire people for most of the work we've done or planned because the annoyance/time/effort would not be worth the money saved and/or we don't trust ourselves to do it properly. For instance, I know how to paint, but I didn't feel like going to the effort of doing our entire living room (which involves lots of masking of trim and steady-handed edging below the ceiling) when I could pay a professional painter a very reasonable labor charge and have it completed by the time I got home from work. I just don't have enough DIY experience to tackle large projects in a timely and skillful way. Something small and novice-friendly, like painting an accent wall or tiling a kitchen backsplash, would be more my speed. I could finish it in a weekend or two and be happy with the quality of work. How is your house coming along? Have you installed the bamboo flooring yet? I WANT PICTURES...or at the very least, I hope we can make it to the next Columbus gathering, whenever that might be.